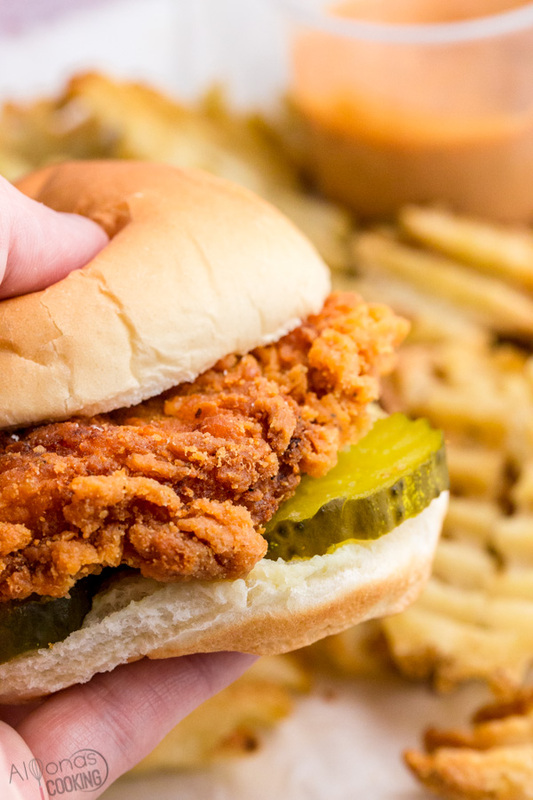 It’s the Original Chicken Sandwich with dill pickles that makes the classic Chick-fil-A menu sandwich. Served on a soft bun and a side of waffle fries, this Copycat Chick-fil-A sandwich can be made right from home for a fraction of the cost! Chick-fil-A is known for their delicious chicken sandwiches and there tasty orange Chick-fil-A sauce! Of course there’s the Chick-fil-A Deluxe sandwich and the spicy chicken sandwich to choose from but if you read the origin of the chicken sandwich it’s the simple non-dressed sandwich that started the success. After all, the chicken breasts are the show of the sandwich so if you get that to taste right the toppings come to play easily. I like to use store bought breaded chicken breasts to make this copycat version but I will include a quick homemade chicken breading recipe in this post for anyone who wants to make the breaded chicken breasts from scratch. I made this chicken breading up on a whim and it makes for one the best fluffy and crisp chicken breading’s! How to make a Chick-fil-A chicken Sandwich? To make a Chick-fil-A sandwich you’d need soft hamburger buns, crispy breaded chicken breasts and two dill pickle chips per sandwich. I like to add American cheese to my sandwich and often order it that way when I’m at Chick-fil-A. What breaded chicken breasts to buy? I have used two kinds of freezer breaded chicken breasts for replicating the Chick-fil-A sandwiches, with both working great. The ones pictured were from a bulk box of chicken fritters and a bag from the Aldi grocery store in the freezer section are good finds. 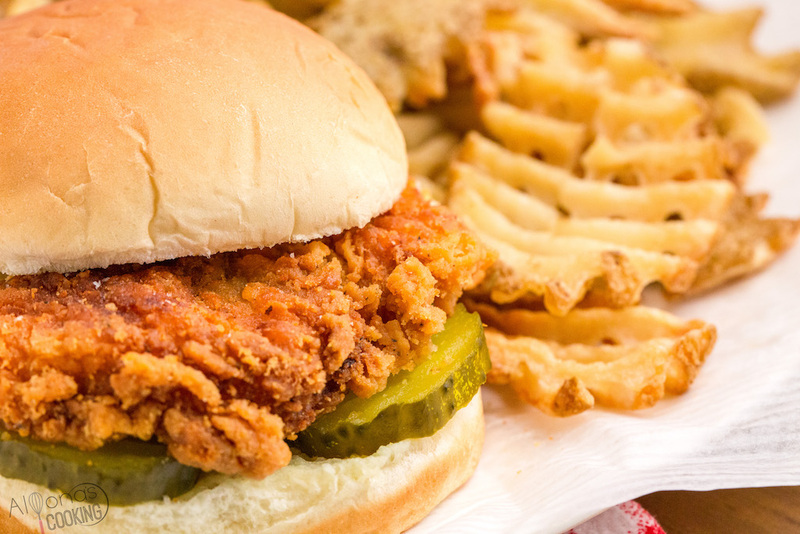 How to make homemade chicken breading for the Chick-fil-A chicken Sandwich? To make your own chicken breading from scratch is simple. Here is a great recipe and since a bisquick mix has leavening in the mix the chicken breading gets fluffy and crisp. Cut each chicken breast in half lengthwise then in half crosswise to get 4 pieces of chicken out of each breast. Toss Bisquick and spices into a zip-loc bag. Dip chicken pieces in milk then the breading and fry on each side until cooked thoroughly. Where can I buy waffle fries like Chick-fil-A? The waffle fries pictured were from the freezer section of Walmart but many other major grocery stores should carry waffle fries in the freezer section that you can make at home. This is very price efficient as the cost of a single order of fries can range from around $3 and a bag of waffle fries from Walmart cost around $2. Which pickles go into the Chick-fil-A chicken sandwich? Dill pickle chips are the kind served in Chick-fil-A sandwiches so any kind of sliced pickle chips that are dill would work best. Try to avoid super sweet pickle chips like the bread and butter chips as those can be too sweet. 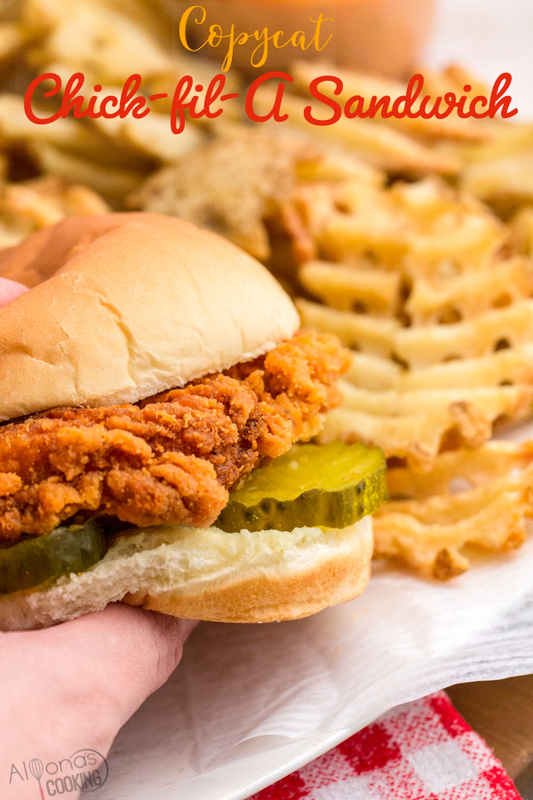 It's the Original Chicken Sandwich with dill pickles that makes the classic Chick-fil-A menu sandwich. Served on a soft bun and a side of waffle fries, this Copycat Chick-fil-A sandwich can be made right from home for a fraction of the cost! Cook freezer ready breaded chicken breasts or strips according to package directions. Place two dill pickle chips (slices) onto the bottom of each hamburger bun. top with cooked chicken breast and the other half of the burger bun. Microwave sandwich for 25 seconds for bun to soften.